For those of you who aren’t ready to commit to a chemical peel or you find that the anti-aging treatment is just not cutting it in terms of your skin’s needs… meet your new best friend: a glycolic-based exfoliant. This liquid-based leave-on Alpha-hydroxy acid (AHA) exfoliant is similar to a chemical peel but is designed to be left on overnight, anywhere from 1 to 3 times a week. Not only does the anti-aging treatment brighten, smoothen and even skin tone caused by the likes of sun damage but it also helps to visibly reduce other signs of aging by targeting fine lines, wrinkles as well as enlarged pores. Unlike many other chemical exfoliants, this formula is actually effective as it falls within the optimal pH of 3.5-3.9 needed to work. If you’re scared about irritation from the high strength of the glycolic acid, anti-oxidants such as chamomile, oat kernel and licorice extract help balance negative reactions for most skin-types (except those that are particularly sensitive). 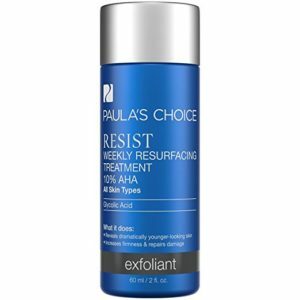 Pro tip time: If you find that your skin type is, in fact, the type that gets easily irritated but still want to give a leave-on chemical exfoliant a shot, try applying this anti-aging treatment and leaving it for a shorter amount of time, say 2-3 hours before washing it off. The next time you use the product, leave it on for a little extra time, and so on, slowly getting more used to it. Finally, always make sure to give your skin enough time to fully recuperate after using this anti-aging treatment – meaning let is rest for a few days unless it’s very resilient before you do another exfoliating treatment. Check out our guide if you’re interested in learning more about anti-aging chemical peels and their benefits.